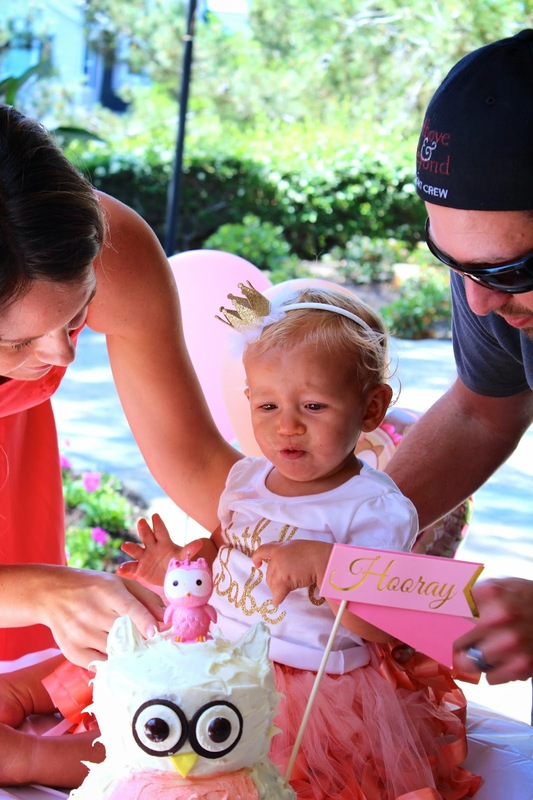 I am so excited to share with you Henley's First Birthday Party today! First of all, can I say, where did the last year go? It seems like just yesterday I had a tiny newborn in my arms, nursing and sleeping the day (and night) away. Now, I have this beautiful little toddler (sniff, sniff) who walks, talks, eats, and dances all day, and thankfully sleeps all night. Time has flown by, but I can say that this year has been the best of my life. Motherhood is the most precious gift that I thought for some time I would never get to experience. Henley is the biggest, most wonderful blessing I could have ever imagined and I am so grateful every day that I get to be her mommy. Anyway, back to the party! From the time she was little, Henley has loved owls. It may or may not have to do with the fact that I love owls and have bought owl-themed toys for her often. As she has gotten older, though, she finds them all on her own and says "whoo whoo" whenever she sees one. So, when thinking of a theme for her party, it was obvious. I also knew I wanted the colors to be coral, pink, and gold. 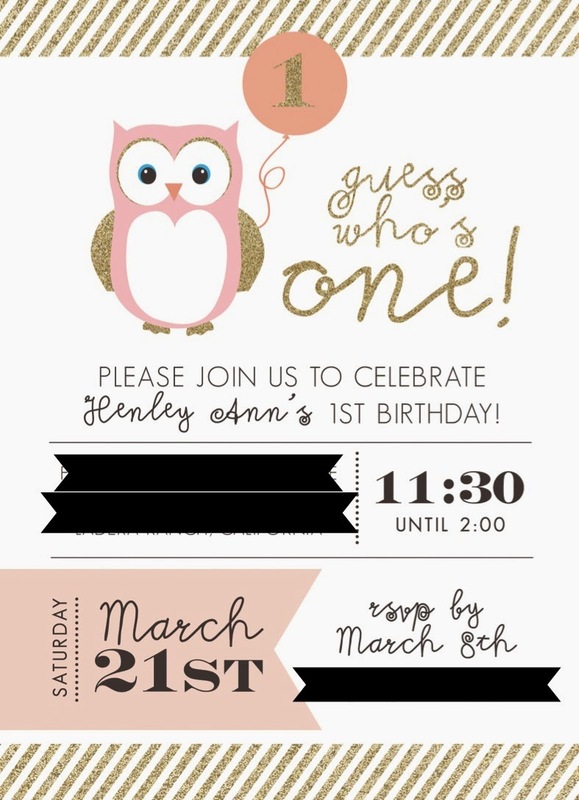 I took to Pinterest to search for pink and gold owl themed parties and found the most perfect invite and matching poster from Prettiest Print Shop on Etsy. I am obsessed with pictures, so I wanted to have a lot of them on display at the party. 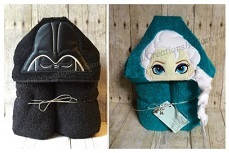 I have loved seeing how Henley has grown in her monthly photos, and I knew her guests would too. I used my Silhouette to cut out monthly titles to pin with the corresponding photo onto a banner. I also framed photos to place around the party. 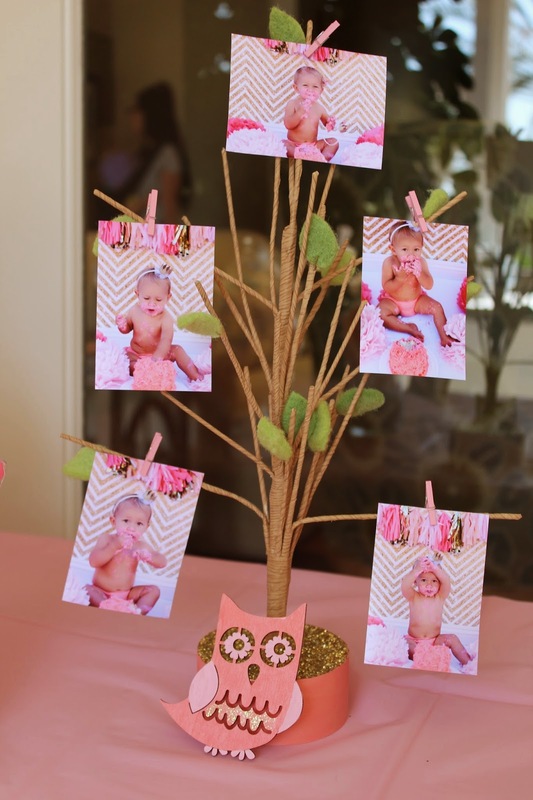 I printed out photos from Henley's Cake Smash and used mini clothespins to attach them to little trees on the dessert table as well. 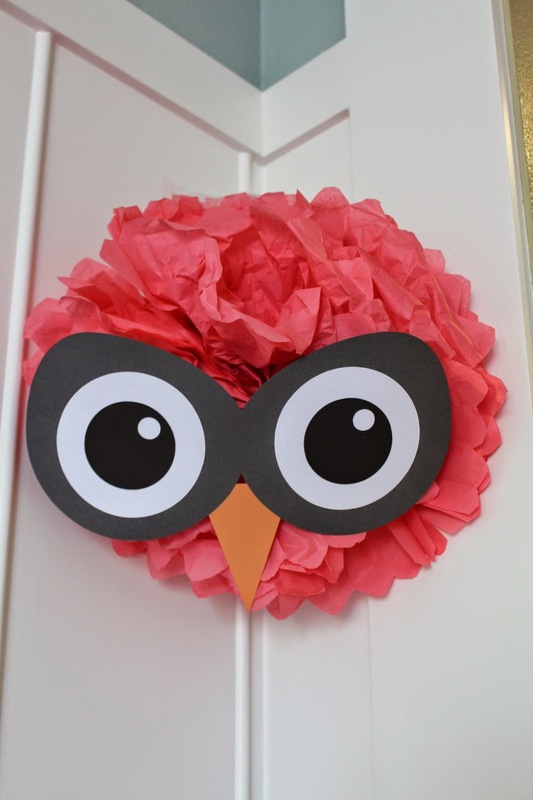 I made owl tissue poms with eyes and beaks that I cut out using my Silhouette. 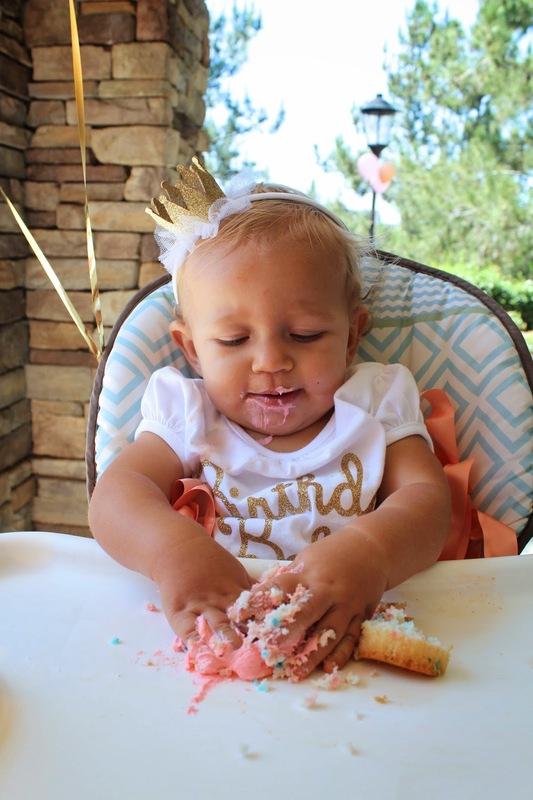 I also used the tissue banner that I made for her Cake Smash Photos. 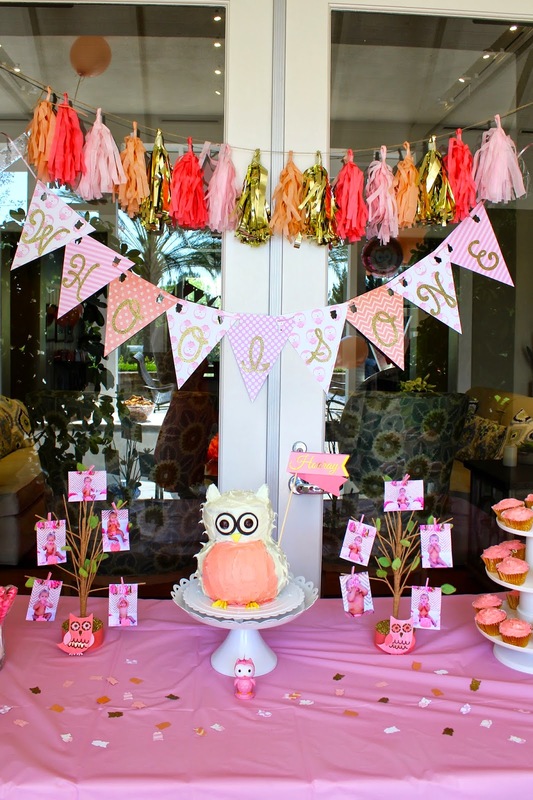 I made two other banners with scrapbook paper that matched the theme of the party that said "Happy Birthday Henley" and "Whoo is One?! 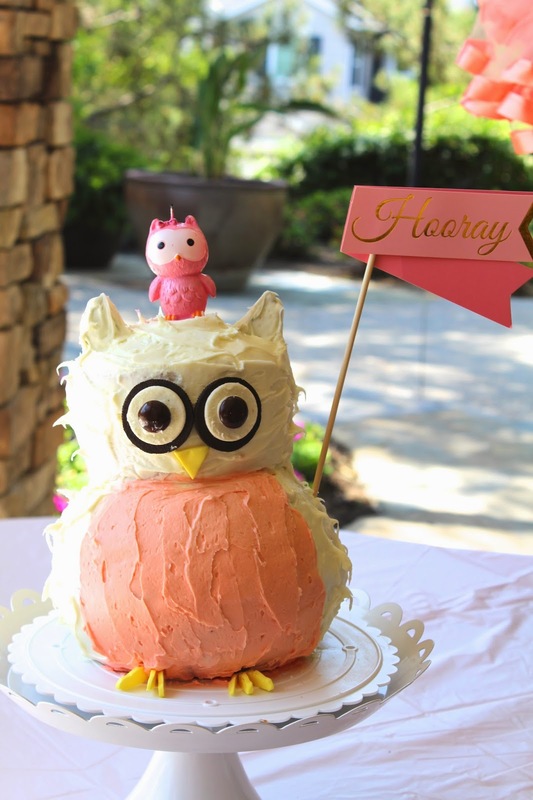 ", and an owl banner for her high chair that said "Henley is One". 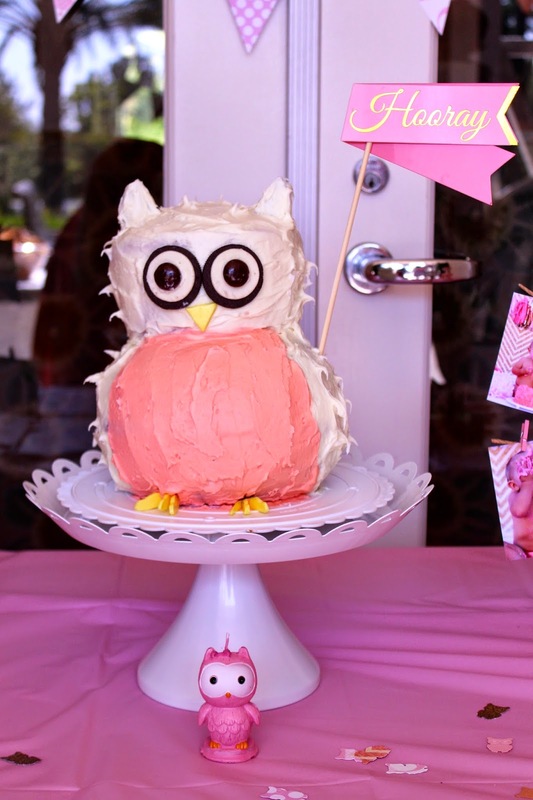 I am most proud of the owl cake that I made for her dessert table. Henley and I were both sick the week leading up to her party and I was almost going to forget making this cake, but I was SO glad that I did. Henley's eyes lit up when she saw it and she kept saying "whoo whoo"! The cake was one of my favorite things that I made and probably the best cake that I have ever decorated...I am soooo not good at cake decorating! For fun for the kiddos we inflated a swimming pool and put balls in it for a ball pit. I found an adorable owl piñata for the older kids to enjoy, which was a hit. Finally, I made these owl goodie bags for everyone, which I think turned out to be a "hoot" of a parting gift! Henley's party was a ton of work, especially feeling under the weather trying to get it all done, but it was SO worth it. Everything turned out perfectly and everyone had a wonderful time. She may not remember her party, but I know we will never forget it! Our planner knew tons of vendors but knows which vendors would work well with my event and venue. They were all great. 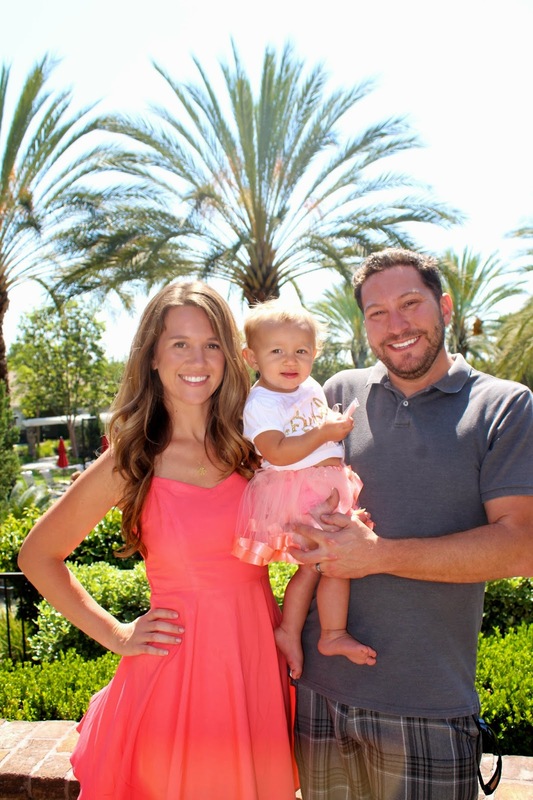 During event management she would try to attend as many vendor meetings as she could. Which was very helpful.